UK Opera Research Alliance, in collaboration with UK Opera Theatre, is continuing its fall series of interdisciplinary lectures on World War I, "Music, History, and Culture in the Shadow of the Great War." 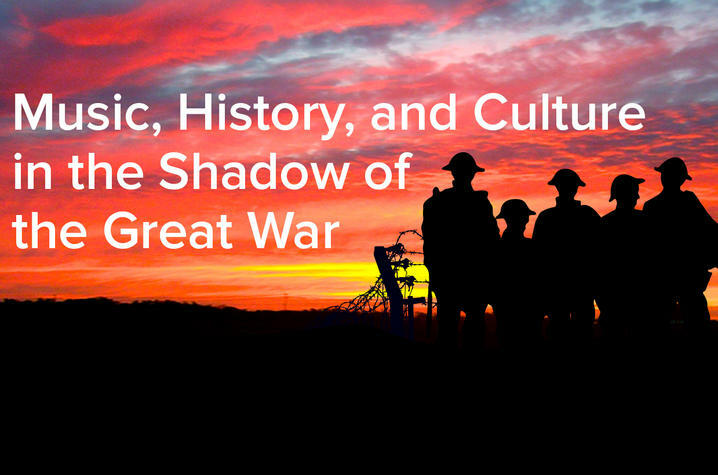 LEXINGTON, Ky. (Oct. 22, 2018) — The University of Kentucky Opera Research Alliance, in collaboration with UK Opera Theatre, is continuing its fall series of interdisciplinary lectures on World War I, "Music, History, and Culture in the Shadow of the Great War." This free public lecture series is bringing together faculty spanning various fields and departments in lively presentations that offer historical and cultural context for UK Opera Theatre’s November performance of "Silent Night" — a Pulitzer Prize-winning opera centered on the nearly mythical Christmas Truce of 1914. The interdisciplinary series, "Music, History, and Culture in the Shadow of the Great War," serves not only to commemorate World War I in this centennial year of its end, but it seeks to enrich the experiences of opera-goers. Thus far, professors from the UK English and history departments, Pearl James, Melanie Beals Goan and Karen Petrone, have shared their research on the war’s visual culture and its contested commemoration, as well as the role of women’s suffrage during the period. In speaking about the mission of the UK Opera Research Alliance, its coordinator Diana Hallman, associate professor of musicology, said, "We want to provide students, faculty and community members with historical contexts for the subject matter of each opera, but also to ask questions about the creative thinking of composers and librettists and to consider our own interpretations in the midst of today's changing perspectives." One major event that will be presented as part of the series is “Memories and Messages of War and Peace: ‘Silent Night.’” This roundtable discussion, moderated by Musicology Professor Ben Arnold, will feature a conversational exchange between the opera's librettist, Mark Campbell; UK Opera Theatre Director Everett McCorvey; and UK Department of History faculty members Karen Petrone and Terri Blom Crocker, author of the book "The Christmas Truce: Myth, Memory, and the First World War," which was published by University Press of Kentucky. This discussion will begin 12:30 p.m. Thursday, Nov. 1, in the Singletary Center for the Arts Recital Hall. Crocker’s keynote lecture on the myth and memory of the Christmas Truce will follow 12:30 p.m. Thursday, Nov. 8, also in the Recital Hall. Pre-Opera Keynote Lecture: “The Christmas Truce: Myth and Memory” with Terri Blom Crocker, 12:30 p.m. Thursday, Nov. 8, at the Singletary Center Recital Hall. UK Opera Theatre will present the 2012 Pulitzer Prize-winning opera "Silent Night" Nov. 9-11. Based on events from World War I, the opera recounts a spontaneous cease-fire between German, French and Scottish soldiers on Christmas Eve in 1914. The award-winning music threads together the emotions of hope, yearning and despair experienced by the soldiers living in the trenches. "Silent Night" will be presented at the Singletary Center. "Music, History, and Culture in the Shadow of the Great War" is sponsored by UK Opera Theatre and the UK Opera Research Alliance, and organized by Diana Hallman with the support of the College of Fine Arts and School of Music funding. The series is part of the yearlong celebration of the centennial of the School of Music (1918-2018). The School of Music at the UK College of Fine Arts has garnered a national reputation for high-caliber education in opera, choral and instrumental music performance, as well as music education, music therapy, composition, and theory and music history.